Grande Hybrid Asparagus | Gurney's Seed & Nursery Co. Extend the asparagus season with this early, vigorous, heat-resistant variety. It's slow to fern out and become fibrous when temperatures exceed 70 degrees. Produces large yields of tender, medium-large to large diameter green spears tinged with purple tips. Excellent disease resistance. Spacing12 - 18 inches apart. Zones3 - 8 (2 with Winter protection). FruitPurple tipped, green speared asparagus. 10 - 12 inch spears. Soil RequirementsAsparagus grows in most any soil as long as it has good internal drainage. Asparagus roots do not like waterlogged soils that will lead to root rot. It prefers a soil pH of 6.5-7.5., and will not do well if the pH is less than 6.0. PruningCut the ferns down to ground level in the Fall once they have turned brown, or in the early Spring before new growth appears. 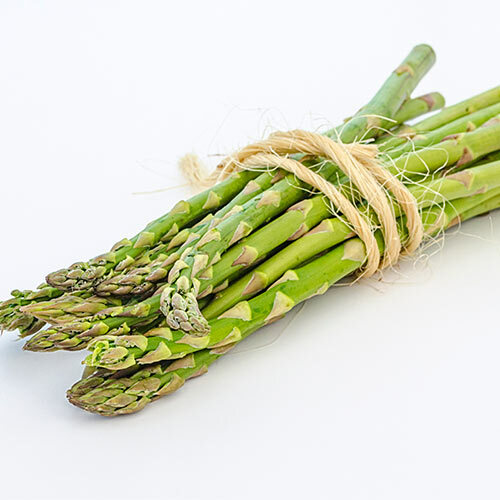 CommentsExtend the asparagus season with this early, vigorous, heat-resistant variety. It's slow to fern out and become fibrous when temperatures exceed 70 degrees. Produces large yields of tender, medium-large to large diameter green spears tinged with purple tips. Excellent disease resistance. DepthPlant at the same depth it is in the plug. These plants can be planted with a trowel.